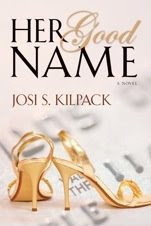 I just finished Her Good Name by Josi Kilpack. Chrissy (short for Chressaidia) is a thirty-five year old single woman who is tired of the dating game, but agrees to a blind date with Micah. The date doesn't go well and gets worse when her identity is stolen. The woman who steals her identity is a Guatemalan woman who uses the money to fund a group in her home country who is working to overthrow the corrupt government. This part of the story was particularly interesting to me because I was born in Guatemala. (This is where I take off on a huge tangent.) Guatemala had been under a dictatorship until 1951 when a president was elected in a democratic fashion. He was a reformer who advocated for rights of workers and introduced a new constitution. Censorship was brought to an end, men and women were declared equal before the law, racial discrimination was declared a crime, higher education was free of governmental control. However, in 1954 the United States, led by the CIA, (due to pressure from business lobbyists) organized a group to overthrow the president. The new dictator disenfranchised three-quarters of Guatemala's voters by barring illiterates from the electoral rolls. He also outlawed all political parties, trade unions and peasant organizations. Opposition newspapers were closed down and "subversive" books were banned and existing copies were burnt in the streets. I believe that due to the overthrow of the president and the dictatorship that followed, Guatemala's people have suffered greatly. Great corruption was ushered in and still continues today. With a corrupt government that takes from the people, workers and the lower-classes cannot prosper and live in poverty. The government continues to be corrupt. There are groups that have tried unsuccessfully to overthrow the dictatorship and bring back a democracy. In Her Good Name, one such group is depicted. While this is only one part of the story, it was very fascinating to me. The woman who steals Chrissy's identity is part of one of these groups that hopes to bring democracy back to Guatemala. Obviously, with stealing identities and other illegal activities, this particular group is not all good. Their intentions are good, but they unfortunately justify bad acts to achieve their purpose. As Chrissy's life continues to fall apart. She's falsely arrested, can't get a job, has thousands of dollars stolen from her, and has huge amounts of credit used in her name. With Micah's help (whose identity was also stolen), Chrissy takes action and begins to seek out who has taken over her life and her good name. I enjoyed this book and the way Kilpack weaved the stories of both women together. I think, in a sense, they were both victims. Unfortunately one victimized the other, but the one who stole the identity has a story to tell as well. An important one. One we never really hear about. One we need to hear about more because Guatemala is also a victim. I haven't been back to Guatemala in over 25 years. Neither has my father, and my mother only went back a few years ago, and she never wants to go back. That's unfortunate. It's unfortunate that a country who had finally found democracy for only a few short years was forced back to a dictatorship because of the malicious actions of the CIA. And now they wonder why Guatemalans flee their country to come here. That's why. Wow. I didn't know all that about Guatemala. I've read about some US involvement in other Central America countries and it's rather appalling. Do you know under what pretense the CIA went in there to do that? Sounds like a fascinating book!! The CIA said that there was fear Guatemala would become a Communist country. I guess workers' rights and labor unions amount to Communism. My personal belief is that businesses in Guatemala did some heavy lobbying after the new president was elected. They knew that with the new president they wouldn't get away with some of their unfair practices. So the CIA did some heavy false propaganda and bribing to oust the president. I guess you could say my view is a little slanted and if you asked someone else they might not agree with me. The backlash against communism in our country is really odd to me. I didn't live in that time, so I cant' really judge it, but from today's world, I don't see what's so scary.